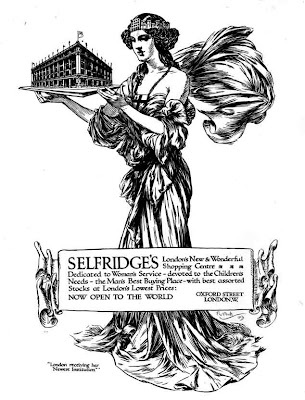 Selfridge's opened it's doors in 1909. The building functioned much like a mall and was the first in London to present its goods as a display, similar to what Macy's and other department stores do now. Selfridge also had a massive impact on the way consumers perceived fashion and shopping with series of advertisements, the picture to the left is one of the many advertisements the store turned out. This particular one presents the goddess Nike wearing a crown of London and holding Selfridge. This image later came to represent shopping as a female desire. This icon became known as Lady London. This is a OK as a brief summary of the history of Selfridges, but lacks the formal description you should have front and center. Once you've described and analyzed the image, THEN you explain how it worked and why it's important for us to consider.